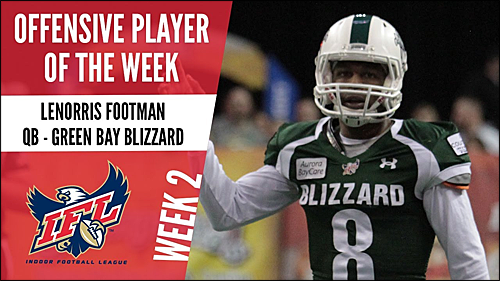 SCtoC will chronicle each each weeks of Indoor Football League Players of the Week (Offensive, Defensive and Special Teams). 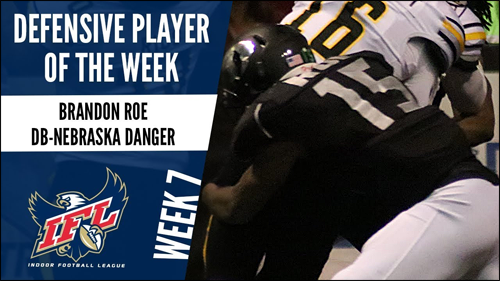 We will list each player, their stats from that week, and the result of their team's game. Also listed will be the honorable Mentions from that week. The names and summaries will appear in descending order with the most recent week at the top. 9 rec, 171 yards, 3 TD (long of 45 yards). Win 72-54 over Tucson Sugar Skulls. 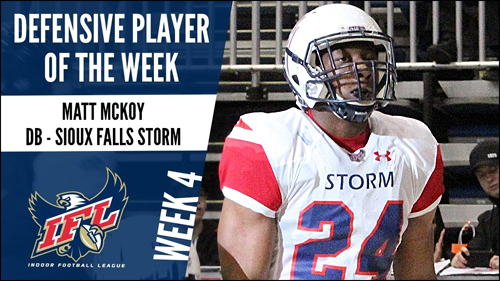 9 total tackles, 0.5 tackles for loss, 2 pass breakups, 2 INT (30 yard return for TD). Win 52-14 over San Diego Strike Force. 6 KR, 120 yds, TD (long of 50 yds); 5 total tackles, 1 tackle for loss. 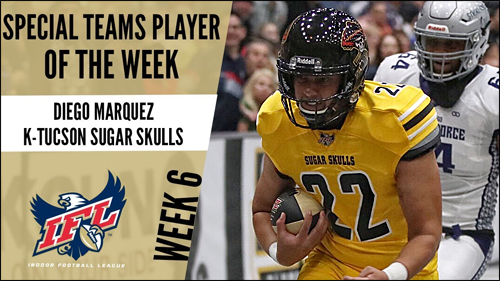 Lose 54-72 to Tucson Sugar Skulls. 8 rec, 43 yards, 4 TD. Win 55-16 over Bismarck Bucks. 7 total tackles, fumble recovery for TD, INT (22 yard return for TD). 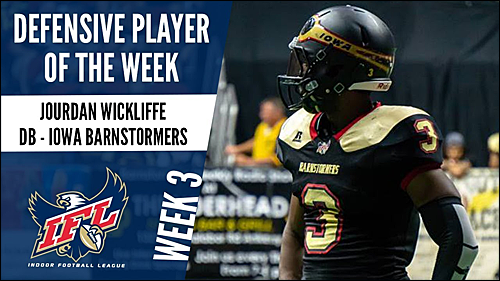 Lose 16-55 to Iowa Barnstormers. 4/5 XP, 2/4 FGs (long of 51 yds). Win 40-34 over San Diego Strike Force. 16 rush, 110 yards, 4 TD (long of 33 yds); 2 KR, 37 yds. Win 64-31 over Bismarck Bucks. 3 INT, 3 total tackles. Win 53-47 over Tucson Sugar Skulls. 8 KR, 176 yds, 2 TD (long of 50 yds); 4 rec, 51 yds; 1 tackle. Lose 48-65 to Iowa Barnstormers. 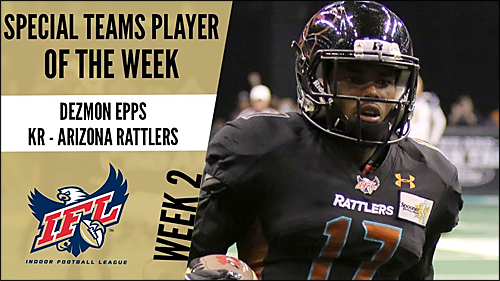 Offensive - Jamal Miles, WR (Arizona Rattlers); Lenorris Footman, QB (Green Bay Blizzard); Keshaun Taylor, WR (Green Bay Blizzard); Jamal Tyler, RB (Iowa Barnstormers), Eric Thomas, WR (Nebraska Danger). 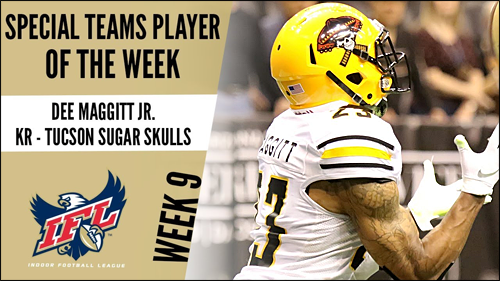 Special Teams - Jimmy Camacho, K (Arizona Rattlers); Sheldon Augustine, KR/WR (Arizona Rattlers); B.J. 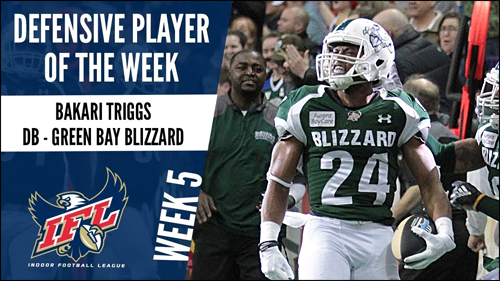 Hill, KR/WR (Green Bay Blizzard); Michael Goines, DL (Sioux Falls Storm); Marques Rodgers, KR/WR (San Diego Strike Force). 14/17, 214 yds, TD; 12 rush, 58 yds, 3 TD. Win 41-20 over Cedar Rapids River Kings. 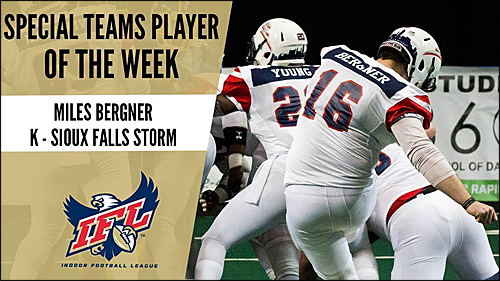 10 solo tackles, 1 fumble recovery return for TD. Win 58-40 over Sioux Falls Storm. 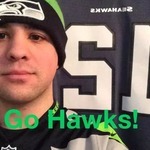 6/6 XP, 1/3 FG (long of 45 yds); 1 rush, 4 yds, TD. Win 51-31 over San Diego Strike Force. 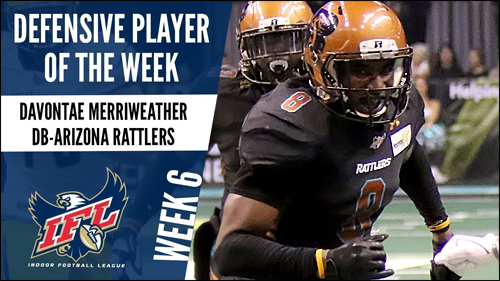 Offensive - Jarrod Harrington, WR (Arizona Rattlers); Kezlow Smith, WR (Green Bay Blizzard); Tommy Armstrong Jr., QB (Nebraska Danger); Jake Medlock, QB (Tucson Sugar Skulls), Mike Jones, RB (Tucson Sugar Skulls). 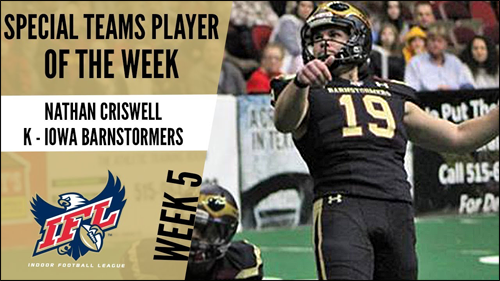 Special Teams - Jimmy Camacho, K (Arizona Rattlers); Blake Levin, K (Bismarck Bucks); Nathan Criswell, K (Iowa Barnstormers); Quincy Walden, KR/RB (Nebraska Danger); Calen Campbell, KR/RB (Sioux Falls Storm). 12/15, 160 yds, 4 TD; 17 rush, 83 yds, 6 TD. 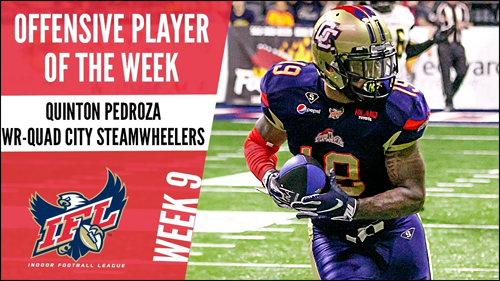 Win 66-52 over Quad City Steamwheelers. 2 INT (1 INT return for TD), 2 total tackles. Win 53-45 over San Diego Strike Force. 7/7 XPs, 1/1 FG (long of 28 yds). 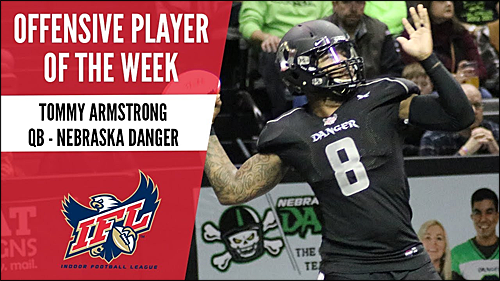 Win 58-55 over Nebraska Danger. 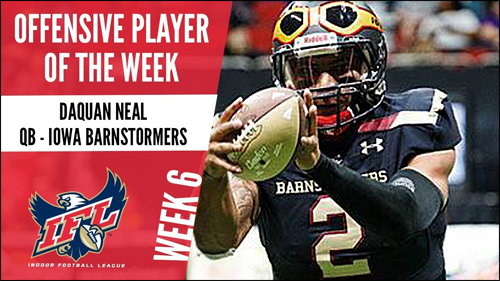 Offensive - Daquan Neal, QB (Iowa Barnstormers); Ryan Balentine, WR (Iowa Barnstormers); Quinton Pedroza, WR (Quad City Steamwheelers); Davonte Sapp-Lynch, RB (Nebraska Danger), Damian Ford, WR (Sioux Falls Storm). Special Teams - B.J. 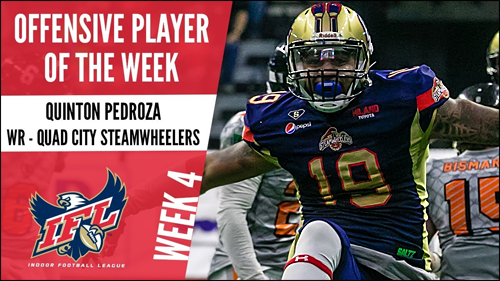 Hill, KR/WR (Green Bay Blizzard); Quincy Walden, KR/RB (Nebraska Danger); Carlos Wiggins, KR/RB (Quad City Steamwheelers); Ernesto Lacayo, K (San Diego Strike Force); Marques Rodgers, KR/WR (San Diego Strike Force). 6 rec, 105 yds, 4 TD (long of 35 yds); 3 rush, 21 yds, 2 TD. Win 58-36 over Cedar Rapids River Kings. 5 total tackles, 1 tackle for loss, 36 yd INT for TD. Win 52-18 over Bismarck Bucks. 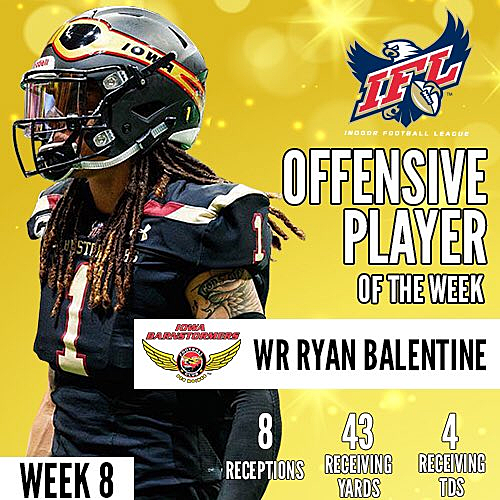 4 KR, 80 yds, TD (long of 50 yds); 5 rec, 68 yds. Lose 18-52 to Sioux Falls Storm. 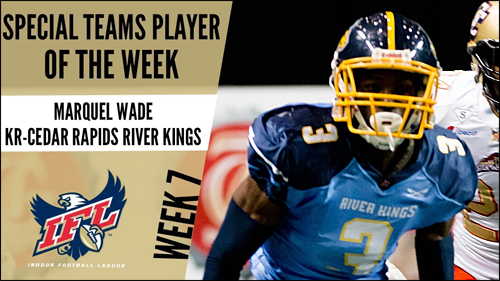 Offensive - Jabre Lolley, RB (Arizona Rattlers); Marquel Wade, WR (Cedar Rapids River Kings); E.J. 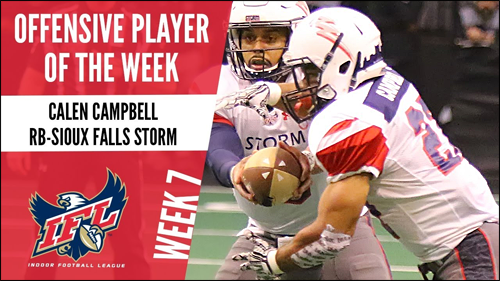 Hilliard, QB (Quad City Steamwheelers); Brandon Sheperd, WR (Sioux Falls Storm), Mike Jones, RB (Tucson Sugar Skulls). 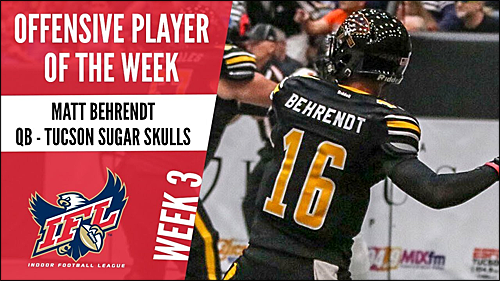 Special Teams - Jimmy Camacho, K (Arizona Rattlers); Henry Nell, K (Cedar Rapids River Kings); Marquel Wade, KR/WR (Cedar Rapids River Kings); Kenneth Rowe, K (Quad City Steamwheelers); Miles Bergner, K (Sioux Falls Storm). 19/25, 234 yds, 8 TD (long of 43 yds); 10 rush, 72 yds. Win 62-42 over Bismarck Bucks. 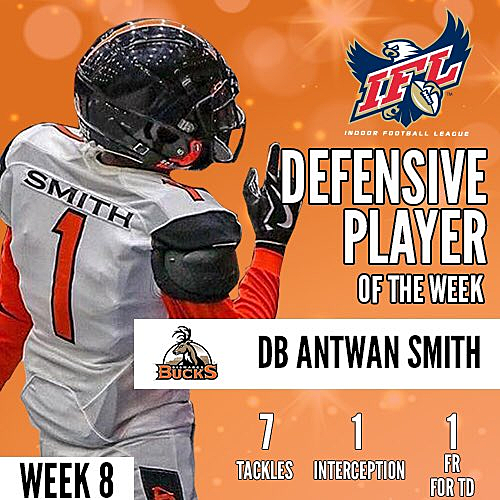 9 total tackles, 1 tackle for loss, 2 forced fumbles, INT (ret. 49 yds for TD). Win 41-3 over Green Bay Blizzard. 8/8 XP, 1/1 FG. Win 65-48 over San Diego Strike Force. 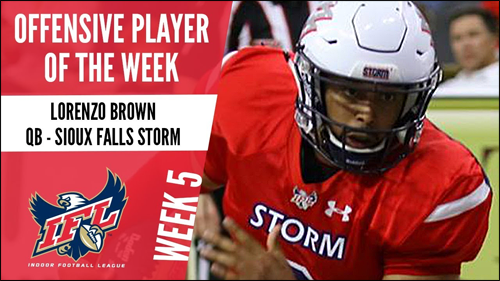 Offensive - Kurt Palandech, QB (Cedar Rapids River Kings); Nathaniel Chavious, RB (Cedar Rapids River Kings); Tommy Armstrong Jr., QB (Nebraska Danger); Lorenzo Brown Jr., QB (Sioux Falls Storm), Shadrach Thornton, RB (Tucson Sugar Skulls). 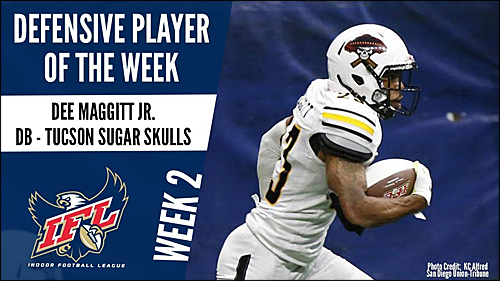 Special Teams - William Gibbs, KR/WR (Bismarck Bucks); Marques Rodgers, KR/WR (San Diego Strike Force); Ernesto Lacayo, K (San Diego Strike Force); Miles Bergner, K (Sioux Falls Storm); Diego Martinez, K (Tucson Sugar Skulls). 11/19, 104 yds, INT; 16 rush, 77 yds, 5 TD. 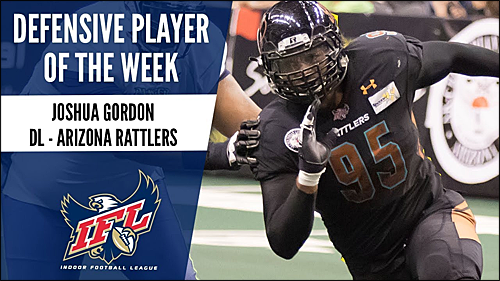 Win 53-52 over Nebraska Danger. 7 total tackles, 1 tackle for loss, 2 INT, 1 pass breakup. Win 65-44 over San Diego Strike Force. 3 KR, 92 yds, TD (long of 54 yds); 1 rec, 34 yds, TD; 1 rush, 11 yds; 2 total tackles. Win 81-37 over Cedar Rapids River Kings. 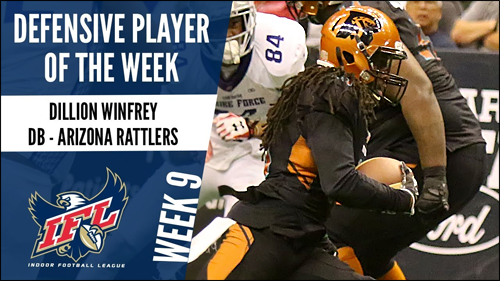 Offensive - Jabre Lolley, RB (Arizona Rattlers); Ryan Balentine, WR (Iowa Barnstormers); Davonte Sapp-Lynch, RB (Nebraska Danger); Keyvan Rudd, WR (Quad City Steamwheelers), Shaquan Curenton, WR (Tucson Sugar Skulls). 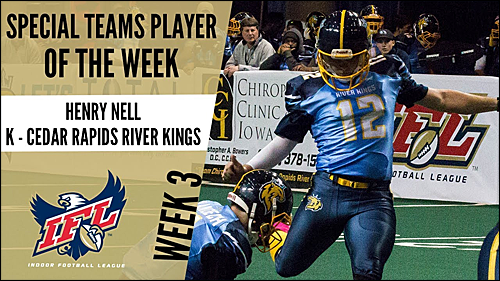 Special Teams - Henry Nell, K (Cedar Rapids River Kings); Cody Barber, K (Green Bay Blizzard); Tyrell Pearson, KR/DB (Iowa Barnstormers); Jarod Haynes, K (Nebraska Danger); Tevaris McCormick, KR/WR (Nebraska Danger). 8/12, 158 yds, 4 TD, long of 48 yds; 3 rush, 23 yds, TD. Win 66-44 over Bismarck Bucks. 4 total tackles, 3.0 sacks; 1.0 sack for Safety. Win 51-21 over Green Bay Blizzard. 4/6 FGs, 5/5 XP; Game winning 33 yd FG with 0:00 remaining. Win 47-44 over Cedar Rapids River Kings. 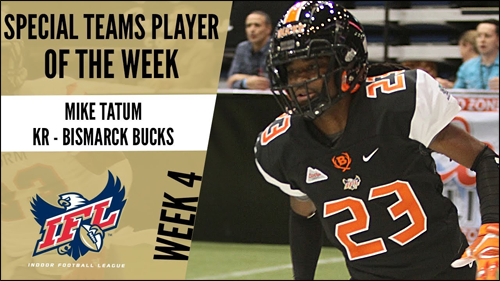 Offensive - Jabre Lolley, RB (Arizona Rattlers); John Gibbs, QB (Bismarck Bucks); Mike Tatum, WR (Bismarck Bucks); Marquel Wade, WR (Cedar Rapids River Kings), Marques Rodgers, WR (San Diego Strike Force). 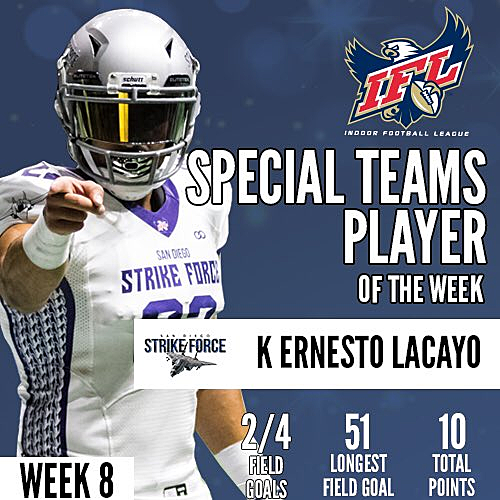 Special Teams - Jarod Haynes, K (Nebraska Danger); Jacob Stytz, K (Quad City Steamwheelers); Carlos Wiggins, KR/RB (Quad City Steamwheelers); Cory Butler-Byrd, KR/WR (San Diego Strike Force); Tra'Von CHapman, KR/QB (Sioux Falls Storm).